The secret weapon of golf courses and landscapers isn’t a secret anymore. The state of the art Vibratech™ Mole & Gopher Chaser is a humane and environmentally friendly way of minimizing damage to your gardens and lawn caused by moles, voles, shrews, gophers, and other destructive burrowing rodents. This advanced, ecofriendly product provides up to 13,500 sq. feet (1/3 acre) of coverage. The Vibratech™ Mole & Gopher Chaser’s motor drive generates powerful vibrations that, though harmless to pets and humans, are irritating to rodents. Intermittent emissions minimize the chance that rodents will become immune to the effect. Constructed from a single billet of aluminum, the units discreet watertight cap allows easy insertion at ground level, protecting your lawn mower and making it virtually invisible. 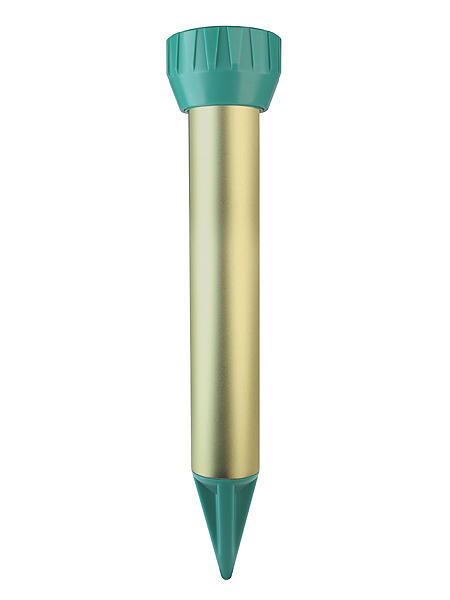 The convenient battery cylinder allows you to change batteries without removing the unit from the ground. 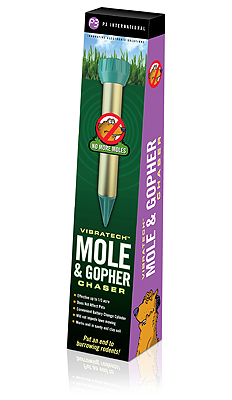 Moles, voles, shrews, gophers and other destructive burrowing rodents “can’t hide anymore” with the Vibratech™ Mole & Gopher Chaser.